Random! : The best cake ever!!!...accidentally.. So, I made a cake!! Let that sink in for a minute....okay? Good..so I made a cake, a nice, coffee and chocolate flavored cake.. 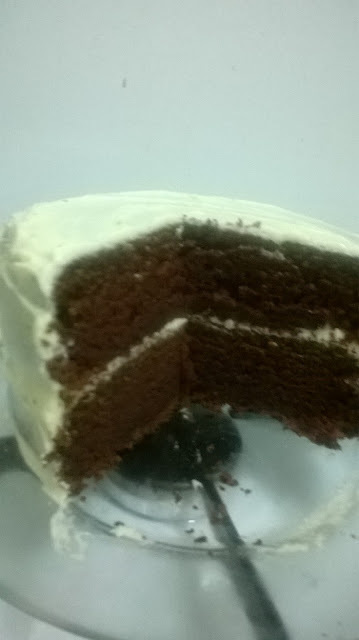 I know....not a red velvet cake..I must have put in too much cocoa, but the result was still impressive..I mean, this cake is insanely moist...and that coffee and cocoa combination is so awesome!! so you know..if you want a birthday cake or something like that, holla at your girl, and please be open to any outcome provided its cooked and tastes good. after all, we are about taste here and not looks, am I right? So, go easy with the cocoa and do not brew your coffee too strong as it will ruin the color. pretty much, sift the dry ingredients separately and everything else in a separate bowl then mix the dry ingredients in in batches. preheat your oven to 200 (celsius) or 375 farenheit and bake for 30-40 minutes. If a toothpick comes out clean, you are good to go.